The survival of the world through the Mayan apocalypse reminds us to check back in on the mother of all end-of-days prophesies, global warming. Global warming promoters have put out models projecting warming of 2 deg to 5 deg C by the end of the century. That would be .2 to .5 deg C per decade. How's that going? Here and below is the latest graph from UAH, one of the organizations that processes and publishes the most accurate data on world air temperatures, derived from "microwave sounding units" on satellites. Looks like the latest temperature is actually down about .4 deg C from the peak reached fifteen years ago in early 1998. If the world were warming at the rate of 2 deg C per century, we should be up .3 deg C since early 1998; if it were warming at 5 deg C per century, we should be up by .75 deg C since then. So the predictions of doom are off by anywhere from .7 deg C to 1.15 deg C in fifteen short years. When can we declare the hypothesis falsified? Christopher Monckton of Benchley, writing at Watts Up With That, uses the occasion to mock those who continue to believe the prophesies in the face of mounting contrary evidence. What we need to do, he says, is to provide a "diplomatic rat hole," that is, a way for the true believers and promoters to climb down gracefully now that they have been proven wrong. Energy Secretary Steven Chu said . . . that scientific evidence of climate change is getting more and more powerful. . . . "Over the last couple of years, the dispassionate, hard science evidence has been mounting, increasing," said Chu. . . . "[Sea level] is rising even faster than we thought. The number of violent rainstorms have increased faster than we thought," he said at the event in New York, adding that though there are "bumps and wiggles" that are not understood, trends are clear in the long term. Got that? Fifteen years of declining temperatures are mere "bumps and wiggles" that are not understood, but we know that warming is occurring by looking at sea level and counting the "number of violent rainstorms." Given that the forum was hosted by the New York Times, apparently no one was so impolite as say out loud that the right way to determine whether the atmosphere is warming is to measure the temperature. Get ready for climate change to become the number one issue at State. And don't worry: you can be sure that Kerry will be one hundred percent impervious to the evidence that the global warming is not actually occurring. Methane is the most destructive of the greenhouse gases. Not only is methane released through melting of polar ice caps, it is also released through the use and extraction of natural gas. . . . An ancillary result of the use of natural gas is the release of methane into the atmosphere when it is burned. The release of methane is only exacerbated if the gas is obtained through hydrofracking. Do you get the strong impression from that, as I do, that poor Ms. Glick does not know that "natural gas" and "methane" are the same thing, and that burning natural gas/methane creates CO2 and water, not methane? 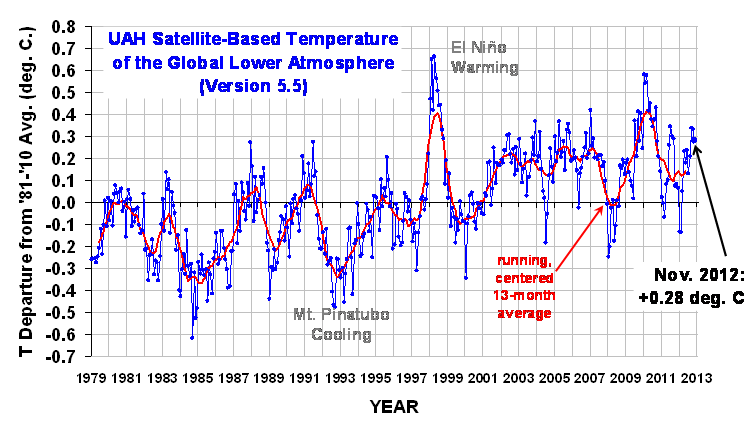 Well, which is worse, that, or not knowing that the increase in global temperatures ceased 15 years ago? You decide! And finally, from the letters to the editor page of the New York Times today, we have more opposition to fracking from none other than Yoko Ono, identified only as "a co-founder of Artists Against Fracking." The New York Times is way, way too cool to admit that they know that Yoko Ono is some kind of celebrity. Industry documents show that 6 percent of the wells leak immediately and that 60 percent leak over time, poisoning drinking water and putting the powerful greenhouse gas methane into our atmosphere. We need to develop truly clean energy, not dirty water created by fracking. Thanks Yoko. And by the way, would you be kind enough to identify which kind of "truly clean energy" would be acceptable to you and your gigantic carbon footprint? Much appreciated.